Between the 1830s and the late 1860s, historians estimate that as many as 350,000 men, women, and children traveled the Santa Fe, Oregon, and California trails. Traders, soldiers, trappers, missionaries, farmers, and fortune-seekers hoped to find purpose, wealth, or a better life in the west. 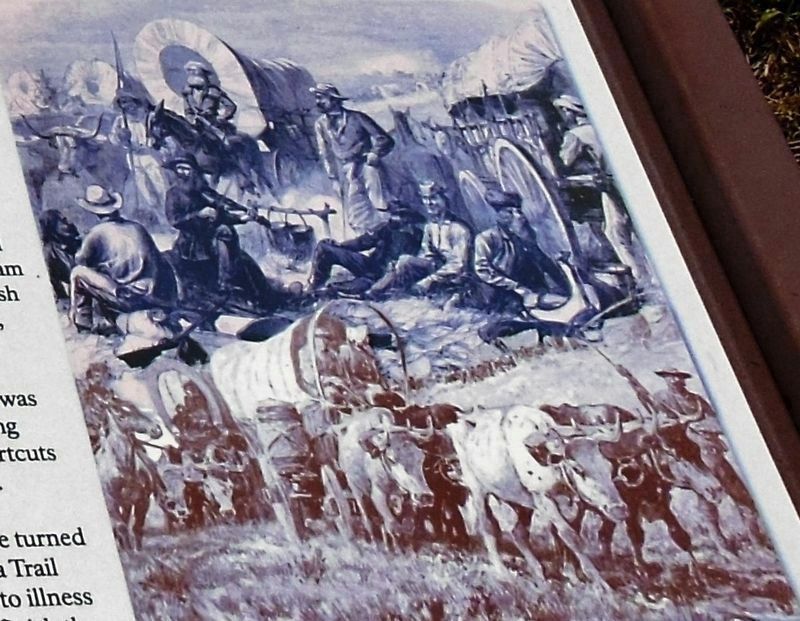 Motivated by the potential for wealth, Mexican and American traders and freighters hauled tons of valuable commodities back and forth on the Santa Fe Trail. During the Mexican War of 1846-1848 thousands of U.S. Army soldiers traveled the trail over territorial disputes. For many, the adventure of traveling west was both frightening and exhilarating. Danger, trials, and even death lay ahead and thousands of letters, journals, and diaries recorded these experiences. "Cold and windy, so cold that every man had to put on two or three coats. The roads are the best I ever see. Camped on a branch of Blue River near the place of leaving the Santafee Road. Mcdonald was unwell all day yesterday. Last night and today quite sick." 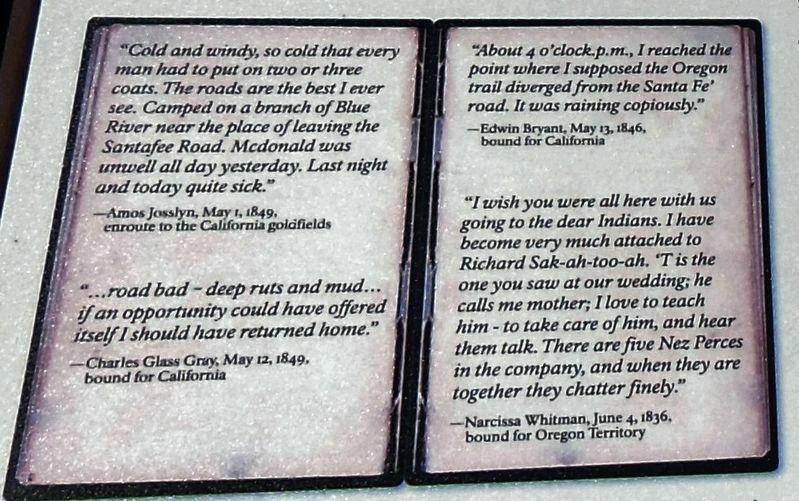 "…road bad - deep ruts and mud… if an opportunity could have offered itself I should have returned home." ”About 4 o'clock p.m., I reached the point where I supposed the Oregon trail diverged from the Santa Fe road. It was raining copiously." "I wish you were all here with us going to the dear Indians. I have become very much attached to Richard Sak-ah-too-ah. 'T is the one you saw at our wedding; he calls me mother; I love to teach him - to take care of him, and hear them talk. There are five Nez Perces in the company, and when they are together they chatter finely." thousands were ready to abandon their old lives and move to the Oregon Territory where they could start over. Then in the fall of 1831, a small group of Nez Perce and Flathead Indians traveled to St. Louis to visit Indian Commissioner William Clark. Their presence prompted eastern missionaries to establish mission outposts in the northwest where they could live, work, and teach among the various tribes. Motivations for the westward movement changed after gold was discovered in California. Tens of thousands of wealth-seeking emigrants traveled the expanding network of trails and shortcuts in an effort to reach the gold fields before the boom ended. Not all travelers found their destiny in the new land. Some turned back and nearly ten percent of the Oregon and California Trail travelers suffered fatal accidents, attacks, or succumbed to illness and were buried along way. Most pioneers were able to finish the journey — realizing their dreams. 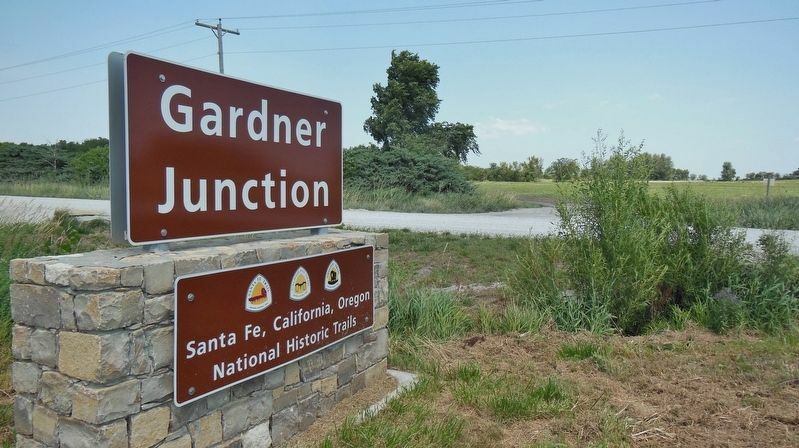 Erected by Santa Fe, Oregon and California National Historic Trails, City of Gardner and National Park Service. Marker series. 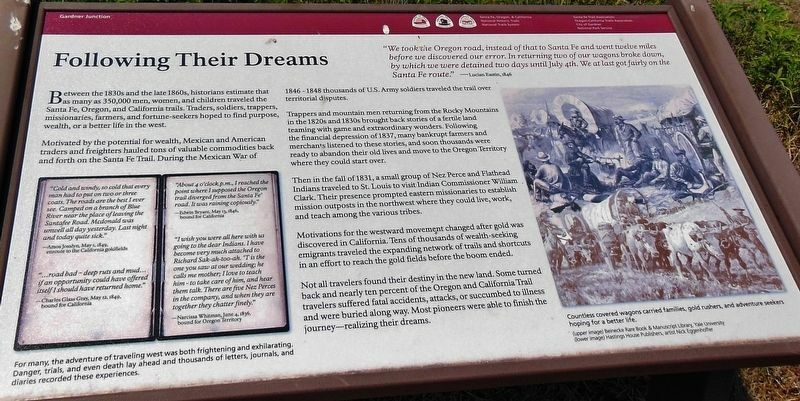 This marker is included in the California Trail, the Oregon Trail, and the Santa Fe Trail marker series. 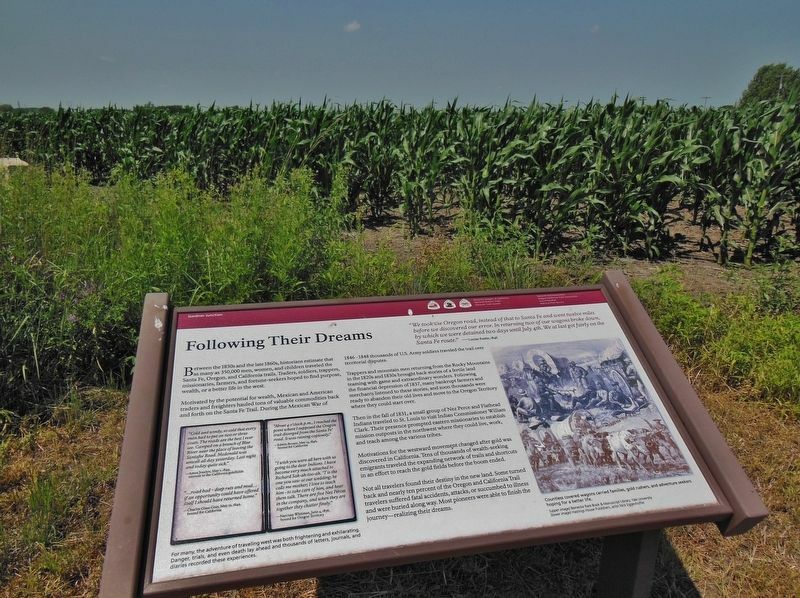 Countless covered wagons carried families, gold rushers, and adventure seekers hoping for a better life.
. Marker can be reached from the intersection of U.S. 56 and West 183rd Street, on the right when traveling west. Touch for map. Marker is located along the west side of the walkway loop in Gardner Junction Park. Marker is at or near this postal address: 32505 West 183rd Street, Gardner KS 66030, United States of America. Touch for directions. Other nearby markers. At least 8 other markers are within 2 miles of this marker, measured as the crow flies. Eye of the Needle (here, next to this marker); Apprehension and Conflict (within shouting distance of this marker); From Prairie Schooners to Locomotives (within shouting distance of this marker); A Look Back in Time (within shouting distance of this marker); a different marker also named A Look Back in Time (within shouting distance of this marker); a different marker also named A Look Back in Time (within shouting distance of this marker); Overland Trails (approx. 2 miles away); The Herman B. Foster Home (approx. 2 miles away). Touch for a list and map of all markers in Gardner. More. Search the internet for Following Their Dreams. Credits. This page was last revised on March 24, 2019. This page originally submitted on March 22, 2019, by Cosmos Mariner of Cape Canaveral, Florida. This page has been viewed 55 times since then. Photos: 1, 2, 3, 4, 5. submitted on March 24, 2019, by Cosmos Mariner of Cape Canaveral, Florida.